Dudeism (The Church of the Latter Day Dude) is the slowest-growing religion in the world... and The Church of Dudeism Ireland is the slowest going chapter of that religion...! 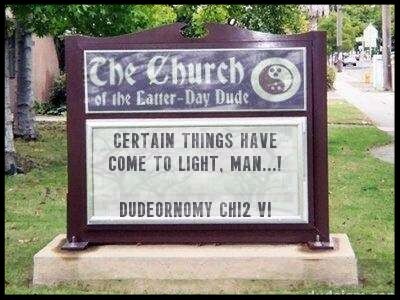 The Church of Dudeism Ireland is inspired by the Church of the Latter Day Dude (Dudeism.com) and such Dudes as Jeffery 'The Dude' Lebowski, Droopy, Budda (laughing one with the belly! ), Cameron Diaz, Floyd (Brad Pitt's character 'True Romance'), Cheech & Chong, Robin Williams and so on and so forth! Dudeism is not a registered religion in Ireland yet so you can’t officiate (officially) at weddings but you can give blessings, funeral orations etc. 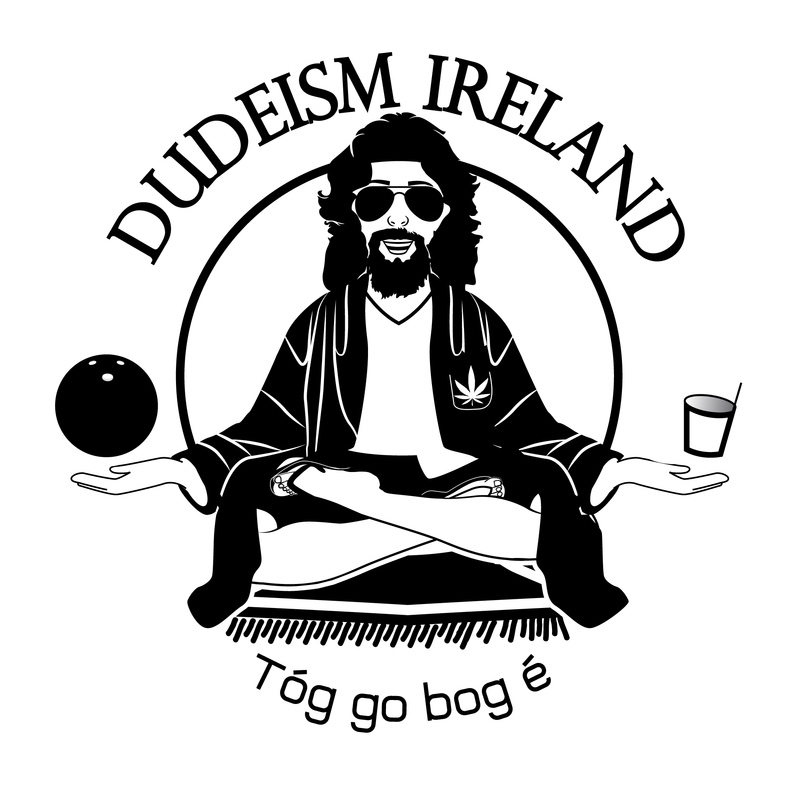 We are working on making Dudeism a recognised religion in Ireland though so keep tuned! One last thing Dudes, when it comes to Dudeism there are no Dudes or Dudettes; as we are all one Dude in abiding! The Very Rev. Bob D.I. 'While Dudeism in its official form has been organized as a religion only recently, it has existed down through the ages in one form or another. Probably the earliest form of Dudeism was the original form of Chinese Taoism, before it went all weird with magic tricks and body fluids. The originator of Taoism, Lao Tzu, basically said “smoke ’em if you got ’em” and “mellow out, man” although he said this in ancient Chinese so something may have been lost in the translation. Down through the ages, this “rebel shrug” has fortified many successful creeds – Buddhism, Christianity, Sufism, John Lennonism and Fo’-Shizzle-my-Nizzlism. The idea is this: Life is short and complicated and nobody knows what to do about it. So don’t do anything about it. Just take it easy, man. Stop worrying so much whether you’ll make it into the finals. Kick back with some friends and some oat soda and whether you roll strikes or gutters, do your best to be true to yourself and others – that is to say, abide'.